What Rusty and Kit Ate in Denmark? Then we had smørrebrød (ø in Danish is pronounced something like “or”) which Denmark is famous for. It means sandwich, and some cafes in Copenhagen had 179 (and more) varieties!! They are all open-faced – and the most delicious things I’ve ever tasted! Americans, I’ve decided, are very foolish to put a slice of bread on top – it kills the flavor of the filling! They had sandwiches of roast beef and onions on dark bread with fried egg on top; ham on rye with vegetable mayonnaise salad and cucumber slicse; dark bread with curry mayonnaise and oodles of mushrooms. What Did It Cost to Travel in Scandinavia in 1954? Rusty and Kit didn’t record much about the prices of lodging or food in the Scandinavian countries of Sweden, Norway, or Denmark. We do know that a night at the Hebron Mission Hotel in Copenhagen, the capital of Denmark, cost each of them 75 cents. Breakfast for two (two glasses of milk plus two buns) set them back 9 cents total. Imagine how expensive it must have seemed to have to pay $32.50 each to cross the North Sea on board the SS Leda or to pay $16.50 for a Norwegian ski sweater, $2.50 for a pair of gloves, and $1.50 for socks? Read more about the travels of Rusty and Kit in The Tucker – Tyler Adventure. What Did It Cost to Travel in Belgium & Holland in 1954? 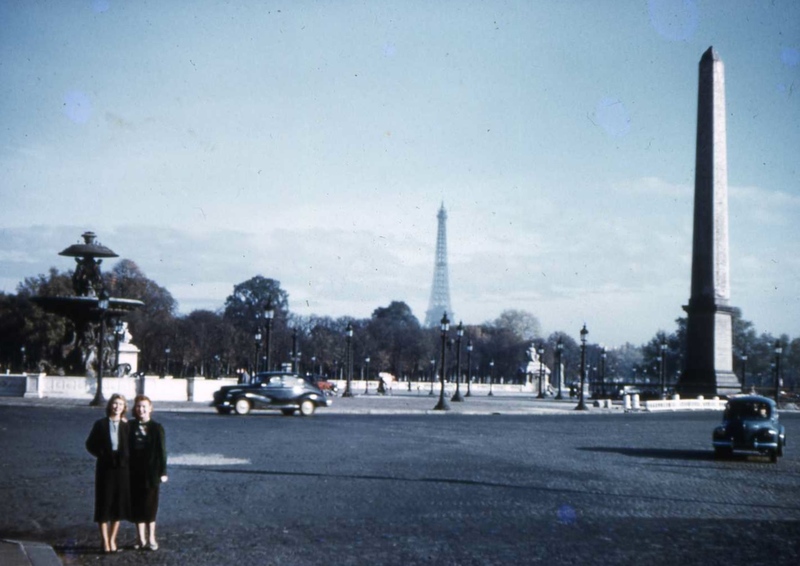 Traveling in Europe in 1954 may sound cheap to us now, but to Rusty and Kit who were on a budget of about $5 a day, spending $4 ($2 each) to stay one night at the Hotel Astoria in Brussels was expensive. According to the girls, their room was magnificent, and they didn’t complain about the price in their letters home. When they discovered that their Amsterdam hotel charged $2.50 per person, however, they switched hotels, finding another one with rates of $1.50 each, including breakfast. Since breakfast was included in the price of their hotel rooms, the girls spent their food money on lunch (75 cents in Delfzjil) and dinner ($1.10 for a meal at Amsterdam’s Moderne Cafe). Snacks included carrots, grapes, tomatoes, and bread all for 35 cents. Other expenses included museum entrance fees, new walking shoes for Kit ($3.98) and a ticket for a piano concert in Amsterdam for $1.10 each. Although Rusty and Kit didn’t write about the treats they ate while in Brussels or Bruge, one of my Belgian friends gave me this recipe for a typical Belgian dessert, Gateau Aux Petits Beurres. Here is her recipe and photos of my efforts. The cake, while impressive to look at, is easy to make and delicious to eat. What are petits beurres? They are those rectangular crisp butter cookies that soften when dunked in a glass of milk or a cup of coffee. Though made by a French company, LU, they are found in most U.S. grocery stores. 1. Melt together the butter, 5 ounces of chocolate, and sugar in a saucepan until smooth. Let the mixture cool off a bit so that it thickens some. 2. Dip the petit beurres in the warm milk, two at a time. They should be soft, but not falling apart. 3. In a 9 x 5-inch loaf pan, layer the softened petits beurres, then pour a layer of the chocolate mixture. Repeat the layers of petits beurres dipped in milk and the chocolate mixture until the pan is filled. 4. Cool in your fridge for several hours. 5. When cooled, use a knife to loosen the edges and remove the cake from the pan and place the cake upside down on a platter. 6. Melt the additional chocolate (another 5 ounces or so). Pour over the top and sides of the cake and cool again in the fridge. Enjoy! 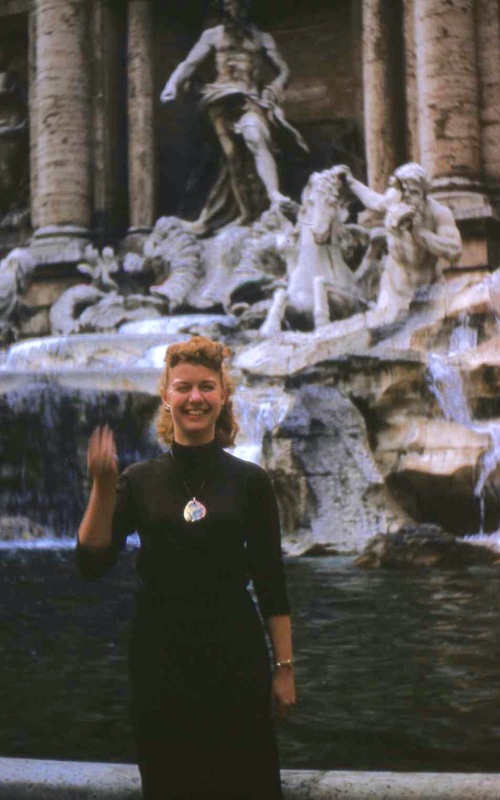 When Rusty and Kit arrived in Rome in November 1954, one of the first things they did was visit the Fontana de Trevi or the Trevi Fountain. Jane Powell was there having her picture taken, and Rusty and Kit each posed for the camera, throwing a coin (or two or three) over their shoulder and wishing. Rusty throws a coin and a wish into Trevi Fountain. According to legend, if you throw a coin with your right hand over your left shoulder into the waters of the fountain, you will return to Rome. That tossed coin is an offer to the Goddess of the Waters, to please the goddess and to beg for a safe return to Rome. Why is the coin tossed over the shoulder? Because if you see a god or goddess with your human eyes, you could turn into a pillar of salt. The second coin tossed into the fountain is a wish for romance, and the third coin tossed is a hope for marriage. What did Rusty and Kit wish for when visiting the fountain, just a few months after seeing the movie “Three Coins in the Fountain”? And how many coins did they throw in? Only they know for sure. But Rusty did find a job, an apartment, and even (or especially) an Italian romance in Rome. And did they return to Rome? Rusty returned within the month, but after leaving Rome in 1955, she never returned, content with her memories. Kit did return, years later, for a visit with her husband. 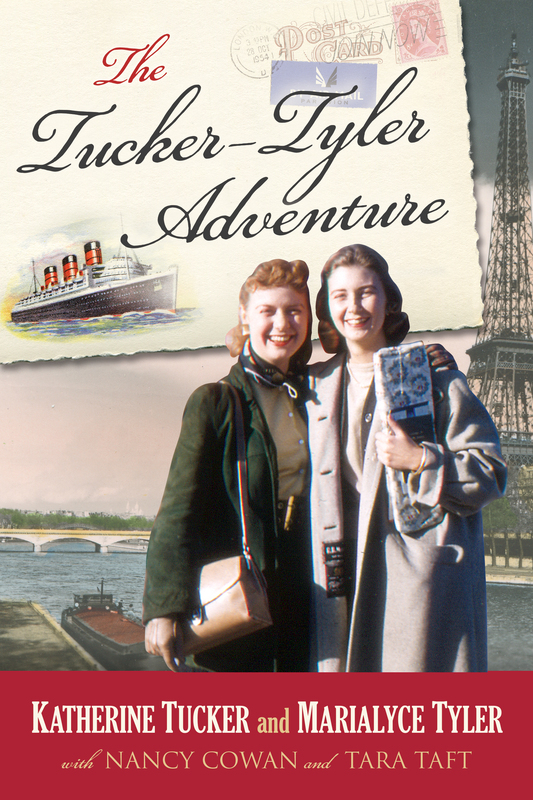 To learn about the travels of Rusty and Kit, read The Tucker – Tyler Adventure. What Did Rusty and Kit Eat in Belgium? Everyday you meet people in the parks or walking down the streets who have a small loaf of bread; they just tear off pieces and eat it as they go. Wonderful! For breakfast: eggs, bacon, French bread, coffee. For lunch: always French bread, fruit, brie, tomato, a French pastry or patisserie. For dinner: ham sandwiches, onion soup, French steak with green beans, salad, French fried potatoes and a peach. And for dessert: café au lait.